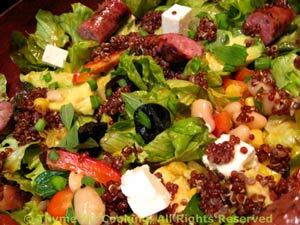 Southwestern Sausage, Corn and Bean Salad, Thyme for Cooking summer salads. Note: This could also be made with 10oz (300gr) turkey cutlets or chicken breasts. Marinate for 10 - 15 minutes before cooking on the barbecue grill. Mix all ingredients well and spoon over meat. Let marinate for 10 - 15 minutes. Cook on barbecue grill, 2 - 3 minutes per side for turkey cutlets, 7 - 10 minutes per side for chicken.